Additional research provided by Jerry S. Bates, Sue Cause, Ronnie W. Faulkner, Roy W. Kelley, J. B. Morris, Willis H. Overby, and Clarence E. Whitefield. Civic clubs play a significant role in the social, economic, and cultural life of North Carolina women and men and have done so for decades. In the early 1800s, people from different professions and occupations began coming together in weekly meetings for fellowship. The origin of these voluntary associations in the United States is usually credited to Reformation leaders such as Martin Luther and John Calvin. Calvin, for instance, taught that all believers should participate equally in church decisions, seeing the church as a free and voluntary association of members. In America, this democratic church model developed first in New England towns with the local Congregationalist church as the exemplar of volunteerism. When insightful French intellectual Alexis de Tocqueville penned Democracy in America (1835), based on his tour of America in the early 1830s, he especially noticed the degree to which Americans formed groups to serve personal interests and solve both large and small problems. He was particularly impressed by New England town meetings, in which the gathered citizens voted on projects such as caring for the poor. Over time, voluntary associations of men and women came to represent the civic conscience of their communities, and they were designated civic or service clubs. These nonprofit organizations work for the public benefit independently and separately from governments and private businesses, perhaps earning profits but always using funds in excess of their operating expenses to further the public purposes expressed in their charters, whether that means serving a particular group or working to aid the whole community. Most boards of directors of these groups are volunteers who oversee the work without compensation. The twentieth century provided an enormous proliferation of voluntary associations with different missions and aims but with a shared commitment to community service. The Benevolent and Protective Order of Elks was founded by 15 actors and entertainers in New York City in 1868 as a social and patriotic association. Goldsboro's lodge, the oldest in North Carolina, dates to 1902. Through the years the Elks have shed much of their secrecy, but still the lodge rituals remain unknown and membership strictly fraternal. The group's constitution states the Elks' objectives, which all involve charity, patriotism, and fraternity. The Improved Benevolent Protective Order of Elks of the World, founded in 1898, is an international fraternal organization of primarily African American members. With headquarters in Winton, N.C., it champions civil liberties and equal opportunity. In 1914, when the Rotary Club opened its first North Carolina chapter in Raleigh, the then-nine-year-old organization already was well on its way to being part of the largest social service movement in the world. Started in Chicago, the Rotarians were businessmen dedicated to rekindling smalltown fellowship. The club is so named because members met in rotation at their various places of business. 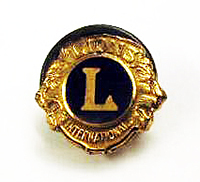 Under the motto "Service Above Self," the international organization has grown to 1.1 million members in more than 25,800 clubs. In the early 2000s North Carolina had 13,800 Rotarians in 230 clubs, almost all of which are descended from the original Raleigh club. North Carolina alone now hosts six Rotary districts and has had three district governors serve as presidents of Rotary International. In their efforts to promote good will and peace via service, North Carolina Rotarians also have contributed to all-ages service and scholarship initiatives, including supporting the international PolioPlus campaign to eradicate polio by the year 2005-Rotary International's 100th anniversary. More than $230 million was raised in this campaign among Rotarians worldwide, a reflection of the group's commitment to furthering international humanitarian efforts. The Kiwanis Clubs of North Carolina date back to 1919 and are an integral part of Kiwanis International, which was founded in 1915 in Detroit, Mich., by businessmen seeking to network. Behind clubs in Asheville and Charlotte, regional groups bonded together to form the Carolinas District, of which almost one-third of its members are South Carolinians. The club's motto, "We Build," has seen fruition in the lives of the children it seeks to aid. In one year, clubs sponsored 147,000 service projects, the culmination of $70 million in funds raised and 6.2 million hours of volunteer time. In North Carolina, Kiwanis initiatives include the Terrific Kids reward program, started in Black Mountain, and the Golden K Kiwanis Club for retirees. North Carolina clubs, representing membership of all ages, have raised millions in support of programs around the world, including the 96 nations that host chapters. Civitan International, a service club whose members have included Thomas Edison and Presidents Harry S Truman and John F. Kennedy, was organized in 1917 in Birmingham, Ala. Worldwide since 1920, Civitan is an association dedicated to the task of building better citizenship through fellowship, knowledge, and service: gaining strength by sharing responsibility and knowledge in a group setting. Among their initiatives, Civitans are strong supporters of the Special Olympics and many other avenues for helping individuals with developmental disabilities. North Carolina District West, which includes 67 clubs, lays claim to being the largest in the world. The numerous state Civitan clubs have long supported the Boys and Girls Homes of North Carolina, a sanctuary for at-risk children located at Lake Waccamaw. Also started in Chicago, 12 years after the Rotary Club's 1905 founding, Lions Clubs first came to North Carolina in 1922, when ten clubs were organized in the state. By the late 1960s, there were 430 North Carolina Lions Clubs with a total membership of 14,400. By the beginning of the twenty-first century, there were 10,600 members in the state. These clubs perform a variety of community activities but are most noted for assisting visually impaired and blind citizens. Behind events such as the annual White Cane Drive, the Lions of North Carolina have raised millions of dollars, which, along with the hundreds of millions raised nationally, are put toward funds for eye exams, glasses, white canes, radios, hearing aids, and college scholarships for children of blind parents. North Carolina Lions built and have maintained Camp Dogwood, a $3 million facility located on the eastern shore of Lake Norman. This camp is used for week-long vacations for approximately 850 blind and deaf individuals each summer. The Optimist Club is an international civic service club established in Louisville, Ky., in 1919, later making its way to Asheville in 1923. Now based in St. Louis, and active in France, England, and throughout the Caribbean, the club is dedicated to youth and community service, advocating "youth safety" and aiding in the development of sports skills. The organization is active in about 150 communities in North Carolina, focusing its broader efforts on eradicating childhood cancer in the world. Sertoma Clubs appeared in North Carolina as early as 1925. Affiliated with Sertoma International and founded in 1912 in Kansas City, Mo., Sertoma is an acronym for "Service to Mankind." Club members have considerable latitude in the kinds of programs and projects they sponsor. In the greater Durham area, individuals have donated hearing aids, restored homes, given scholarships, sponsored "career days," and promoted various educational events. The club's Service to Mankind Award has been given to multiple North Carolinians, including eminent UNC-Chapel Hill academic Louis Round Wilson. Ruritan, a rural community service organization, first appeared in North Carolina in 1935, seven years after its initial founding, when it was organized at Sunbury. By 1946, the same year Swindell Lowery of Pasquotank County was elected national president of Ruritan, 12 new clubs were organized in the state, giving North Carolina in January 1947 a total of 219 clubs and 7,872 members. Illustrative of Ruritan's goal of encouraging leadership from among rural people are the variety of fields in which its members have been active: extension directors, Farm Bureau roles, parent-teacher positions, school board leadership, Boy Scout guidance, and leadership in allied activities such as insurance and merchandising. Work and experience with Ruritan has helped advance many members in industrial management, local government, and the military, often through experience in public speaking. Pilot Club International, a women's service club, was begun in Macon, Ga., in 1921; the first club in North Carolina was organized in Winston-Salem in 1934. Three presidents of this international organization have been North Carolinians. Among the projects sponsored or supported in the state by the club have been those pertaining to schools, hospitals, nursing homes, group homes, the Red Cross, Alzheimer's disease wards, Head Start, bicycle helmets, bulletproof vests for law enforcement officers, flags for classrooms and outside poles, the Special Olympics, Habitat for Humanity, and other causes. In the early 2000s, of the more than 600 Pilot Clubs worldwide, 38 were in North Carolina. Exchange Clubs originated in Detroit in 1896, when a group of men began meeting for a friendly luncheon to exchange ideas on fellowship, friendship, and business, civic, and family interests. In time, they came to see themselves as service oriented. In 1911 they formed a civic club called the Exchange Club. 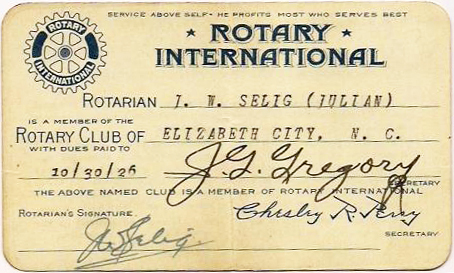 The first Exchange Club in North Carolina was formed in Wilmington in 1924 with 23 members. The club was active in getting the River Road built to what is now the North Carolina State Port. The club raised funds to help the completion of the inland waterways in the Wilmington area. Other clubs were formed in Winston-Salem, Raleigh, and Greensboro in 1935. Durham and Reidsville clubs were formed in 1941, and Henderson, Roxboro, Hillsborough, Wilson, Murfreesboro, Kernersville, and Elon College Clubs soon followed. Over the next decades, Exchange Clubs were formed over all of North Carolina. By the early 2000s, 46 clubs made up the North Carolina District Exchange Clubs, representing 1,200 members and working in areas that include crime prevention, fire prevention, youth of the month/year awards, "Give a Kid a Flag to Wave," Book of Golden Deeds Award, community service awards, and the Freedom Shrine project. North Carolina Exchange Clubs have conducted many fund-raising and service projects to provide community services. The National Exchange Club Foundation for the Prevention of Child Abuse was set up in 1979 and works through local clubs to form Child Abuse Centers. The Winston-Salem center, which opened in 1981, was the first in North Carolina and the second in the nation. Albert Coates, By Her Own Bootstraps: A Saga of Women in North Carolina (1975). Coates, Citizens in Action: Women's Clubs, Civic Clubs, Community Chests. Flying Buttresses to Governmental Units (1976). Robert D. Putnam, Bowling Alone: The Collapse and Revival of American Community (2000). Alvin J. Schmidt, Fraternal Organizations (1980). Markovich, Jeremy. "The Keepers of Our Communities" Our State magazine. November 2011. http://www.ourstate.com/civic-clubs/ (accessed November 29, 2012). "10 Organizations, Civic, Social, Patriotic, Miscellaneous." Hornet's Nest: The Story of Charlotte and Mecklenburg County. Charlotte Mecklenburg Library http://www.cmstory.org/content/10-organizations-civic-social-patriotic-miscellaneous (accessed November 29, 2012). Beito, David T. From Mutual Aid to the Welfare State: Fraternal Societies and Social Services, 1890-1967. Chapel Hill: University of North Carolina Press. 2000. http://books.google.com/books?id=FIOp0ofIwDwC&lpg=PP1&pg=PP1#v=onepage&q&f=false (accessed November 29, 2012). Powell, Lew." "Where are you, Daughters of United Sons of N.C.?" North Carolina Miscellany (blog). North Carolina Collection, University of North Carolina at Chapel Hill. May 24, 2011. http://www.lib.unc.edu/blogs/ncm/index.php/2011/05/24/where-are-you-daughters-of-united-sons-of-n-c/ (accessed November 29, 2012). "N.C. ASSOCIATION FOR THE BLIND" North Carolina Highway Historical Marker Program. http://www.ncmarkers.com/Markers.aspx?ct=ddl&sp=search&k=Markers&sv=M-40 (accessed November 29, 2012). "Membership Card;, Accession #: H.1992.138.26." 1926. North Carolina Museum of History. "Pin, Accession #: H.2004.141.8." North Carolina Museum of History. 1 January 2006 | Bates, Jerry S.; Cause, Sue; Faulkner, Ronnie W.; Kelley, Roy W.; Morris, J. B.; Overby, Willis H.; Whitefield, Clarence E.; Williams, Wiley J. The IBPOE is headquartered in Winton, NC. You may wish to contact them with your question: http://ibpoew.org/. You may also want to contact the Greensboro Chamber of Commerce -- http://business.greensboropartnership.org/list/ql/government-education-i.... They may have some information on civic organizations as well.